You can use the navigation mode in combination with the heading function to fly an assigned heading to intercept a course. The procedure illustrated in Figure 4-13 takes advantage of the ability to arm the navigation mode while the heading mode is engaged. Figure 4-13. Flying an assigned heading to intercept a course. 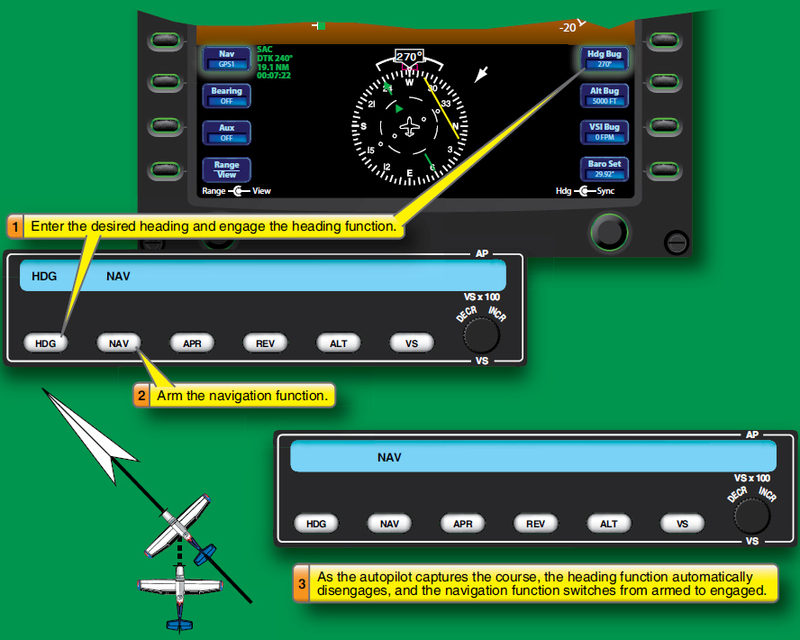 Figure 4-13 illustrates selecting the assigned heading, setting up your FD/FMS autopilot for the assigned course, engaging the heading mode, and arming the navigation function. Once the aircraft reaches the course, the autopilot automatically disengages the heading function and engages the navigation mode. On most FD/autopilots, courses can be intercepted by first using the heading “bug” to select an intercept course and then engaging the heading function. Alternatively, engaging the navigation function in some units causes the FD/autopilot to select an intercept heading, engage the heading function, and arm the navigation function. This can be a cause for conflict if ATC assigns an intercept heading, but the FD is programmed to use one angle. In those instances, you need to set the heading into the FD/autopilot, fly, and control the intercept until the aircraft is close enough to complete the intercept and capture without deviating from the ATC instructions. At that point you can select and arm the navigation mode, which completes the intercept and begins tracking the selected course. Use the FD/autopilot to fly an assigned heading to capture and track a VOR and/or RNAV course. Determine if the FD/autopilot uses preprogrammed intercepts or set headings for navigation course interceptions. Determine the indications of navigation mode armed conditions. Determine parameters of preprogrammed intercept modes, if applicable. Determine minimum and maximum intercept angle limitations, if any.